Tyrrell had to watch from the stands as Kilkenny booked their passage to another All-Ireland final. 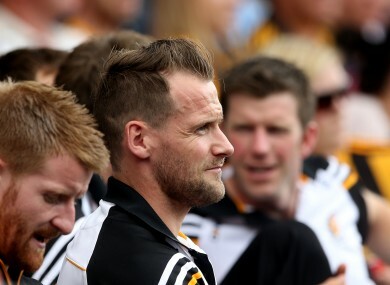 KILKENNY COULD BE without two of their most experienced men for this year’s All-Ireland final, with Jackie Tyrrell and Richie Power both facing a race against the clock. Speaking after Sunday’s victory over Waterford, Cats boss Brian Cody revealed that the Allstar pair are still doubts for the decider on 6 September. Tyrrell is due to see a specialist this week as he continues his recovery from the ankle stress fracture which ruled him out of the semi-final. Power hasn’t featured yet this season due to a knee injury but Cody remained hopeful that both will return to training ahead of the showdown with Tipperary or Galway. “Jackie is seeing a specialist on Tuesday,” he said. “We’ll know more then. “Until then, he’s a wait-and-see job. We’re all hopeful. There’s what, four weeks till the final? Certainly we’re hoping he’ll be back in contention. On Power, he added: “Richie has put in a huge amount of work. He’s working very hard and he is progressing. Cody also praised both Richie Hogan and Michael Fennelly who battled through serious injury concerns to play 70 minutes in Sunday’s win. Hurler of the year Hogan scored 0-5 from play but revealed afterwards that he had needed multiple painkilling injections in the week leading up to the game. “On Wednesday, things didn’t look well for him at all really,” Cody said. “I think it’s huge testament to the sort of fella he is and the character he showed. “He just put his head down and he just wanted to get himself right and the attitude he showed was top class also. “The expertise of our medical team was absolutely crucial. It was a serious, serious position we were in a few days ago. “Michael Fennelly has had problems for a long, long time. Essentially the last game was played was against Wexford, which was a long time ago now. “He really didn’t take part in hurling training, at all, to be honest about it. Email “Two of Kilkenny's most experienced players are still doubts for the All-Ireland final”. Feedback on “Two of Kilkenny's most experienced players are still doubts for the All-Ireland final”.